As a mom, I try to make every holiday special. Even the little ones! 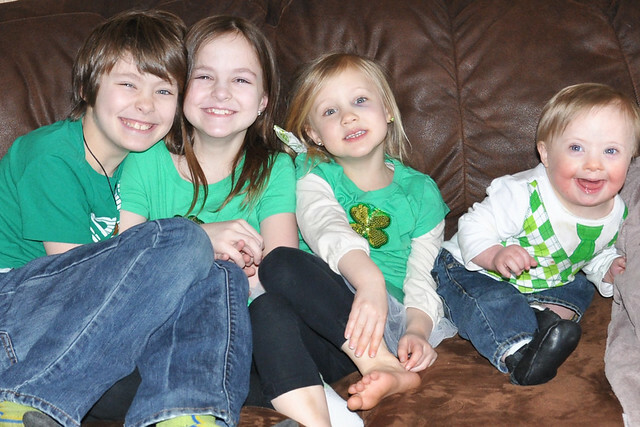 Prior to having kids, St. Patrick's Day was just for wearing green, and maybe going to a party. My husband is Irish, so he's definitely more passionate about the holiday than I am! Then I had kids. The drive to celebrate every holiday started when my oldest was 1, and only increased over the years! While I don't go over the top, I do try to decorate and add little touches that make the day extra special! St. Patrick's Day fell on a school day this year, which didn't leave much time for a special breakfast. 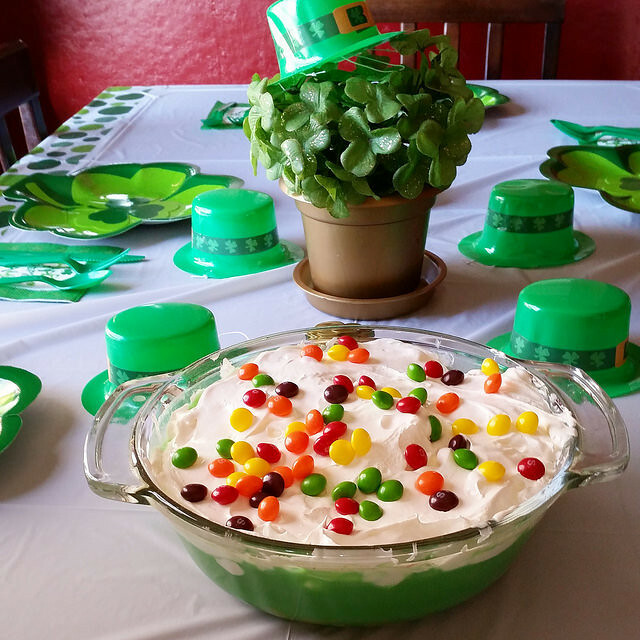 I usually make green shamrock pancakes, but with our 20 minute wake up and go schedule, all we had time for was St. Paddy's Day Lucky Charms! Lexie, of course, refused to even try them, but Dylan said they were delicious! 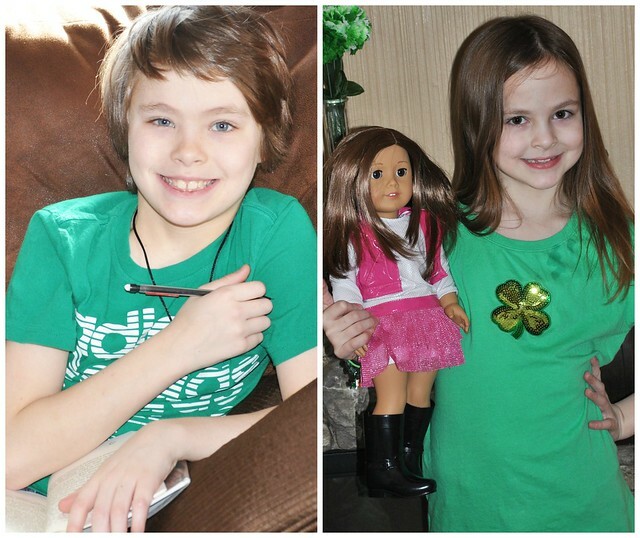 The big kids put on their green and headed to school! Shortly after they left, Lily and Liam woke up. Lily's eye was looking rough from her injury the evening before, but she was in a great mood. 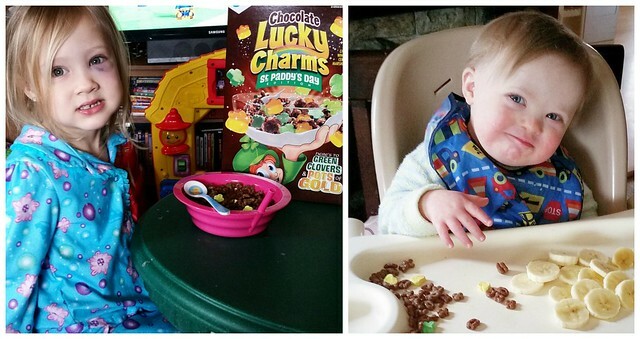 She immediately spotted the new Lucky Charms, and asked for some. I decided to give some to Liam, too, but he was disgusted by them. They didn't stand a chance against his beloved bananas! 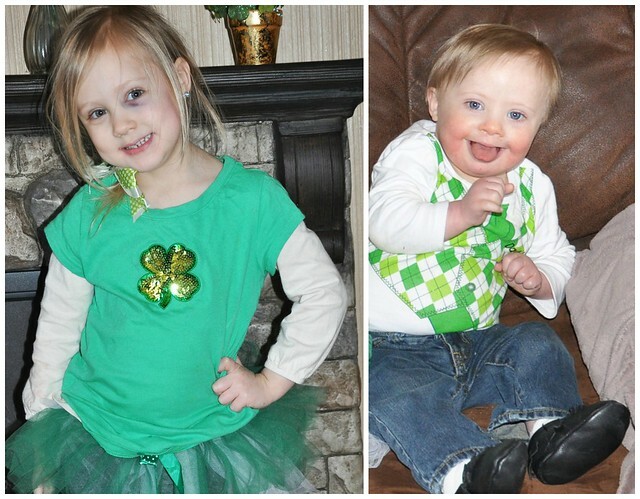 I got them dressed for the day, and readied the house for Liam's Physical Therapy Session. Even though it was a (little) holiday, he still had to work! Liam is happy most of the time, and only gets fussy when he's sick. Fussy Liam is even mild. He was teething yesterday, and was not thrilled with his PT session. It was funny to watch, though. 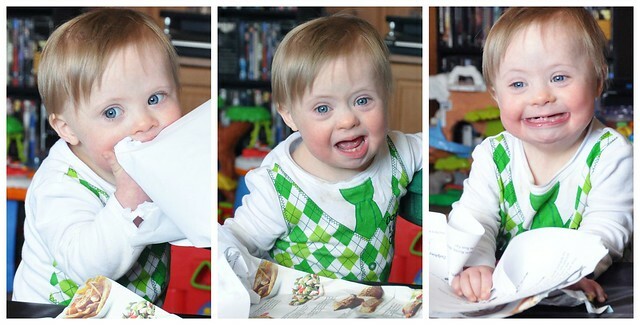 He kept going from grinning to screaming and back to grinning! 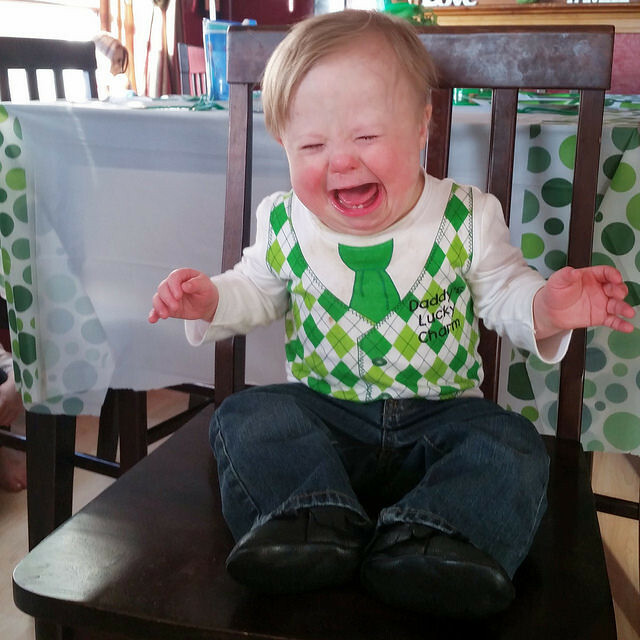 His pout is just as epic as his joyful smile! After the session, I gave Lily her "Taste The Rainbow" sweet treat that I prepared the night before. I sent them in Dylan, Lexie, and Grant's lunches, too! Lily kept saying, "Thank you, Mommy. Thank you so much!" I'm assuming they were a hit! They were super easy, too! 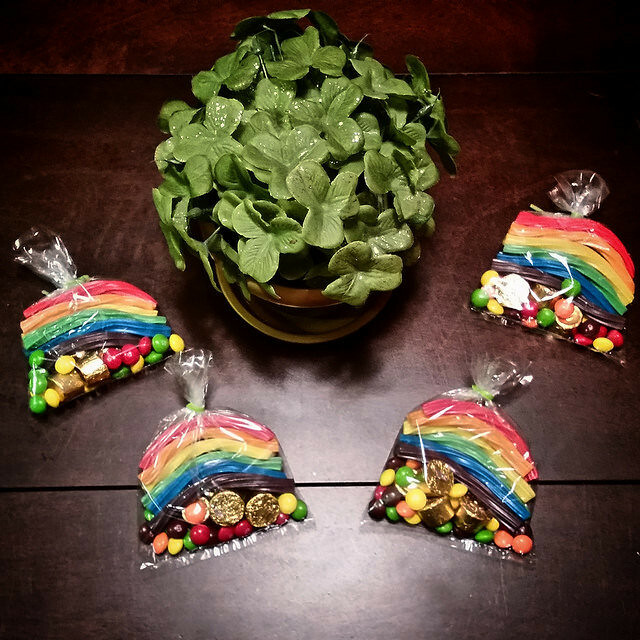 All you need is small cellophane favor bags, rainbow Twizzlers, Skittles, and Rolos. Fill the bottom of the bag with a handful of Skittles and a few Rolos. Cut Red, Orange, Yellow, Green, Blue, and Purple Twizzlers in half, then form a rainbow over the Skittles and Rolos. Tie bag. SO easy! Liam didn't have his usual speech therapy session, but Lily did have Storytime. She is going to do so well with preschool in the Fall. She goes in without me, participates happily for an hour, and runs out with her craft at the end of the session. 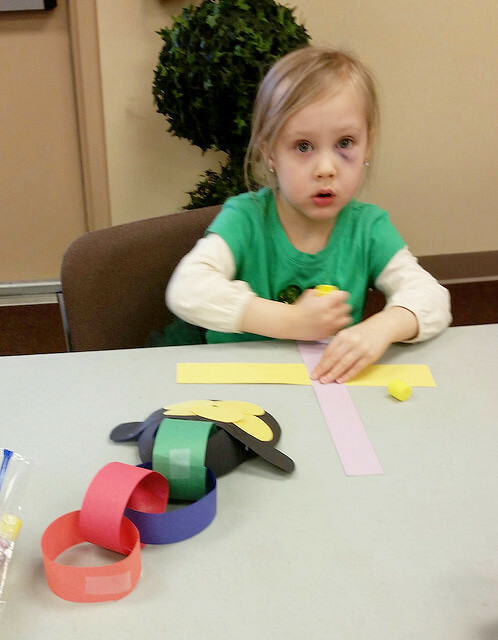 When I try to go into the room to take pictures during craft time, I get THE look, and she tells me to leave the room. Okay, Miss Independent! When we returned home, Liam napped, and Lily snacked. 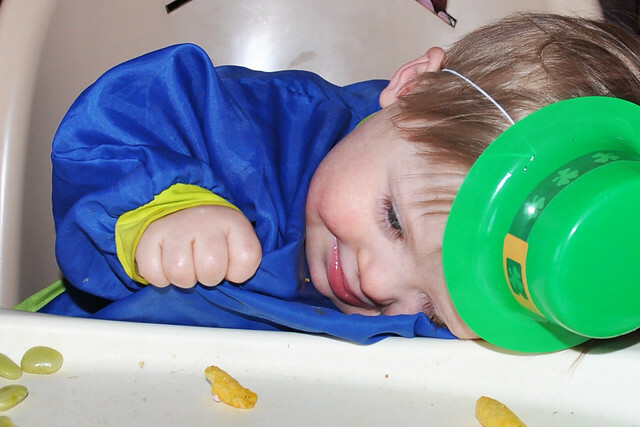 After his much needed nap, Liam was back to being a happy leprechaun! Or mischievous. You decide! 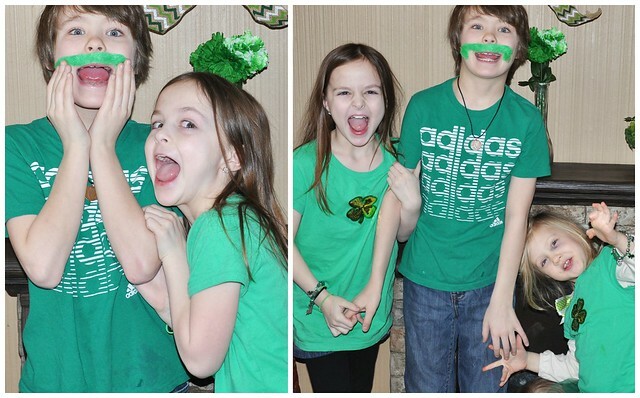 After that, the kids got their St. Patrick's Day treat (charm bracelets for the girls and a green mustache for Dylan), and Liam teethed some more! 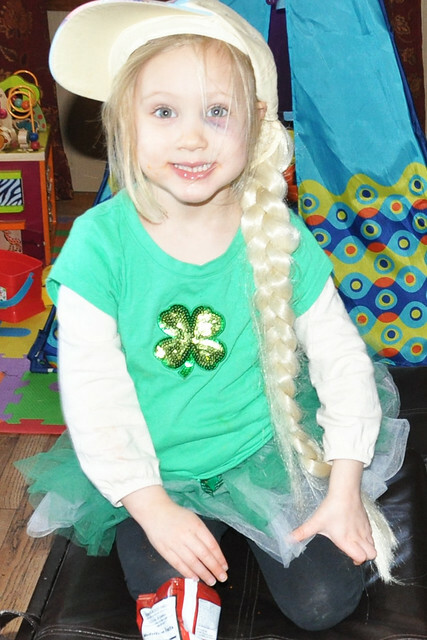 We ended our fun day with our annual St. Patrick's Day dinner! The kids were so excited about their special dinner! Grant chose potatoes, ham, and baby lima beans. For dessert, we had a incredibly easy, but oh so delicious pudding parfait! When I say easy, I really do mean easy. I used 1 large box of vanilla pudding mix. I mixed it with skim milk and green food coloring. I softened a tub of Cool Whip, and spread it over the top. A sprinkling of Skittles added a festive touch! Easy, and they LOVED it! 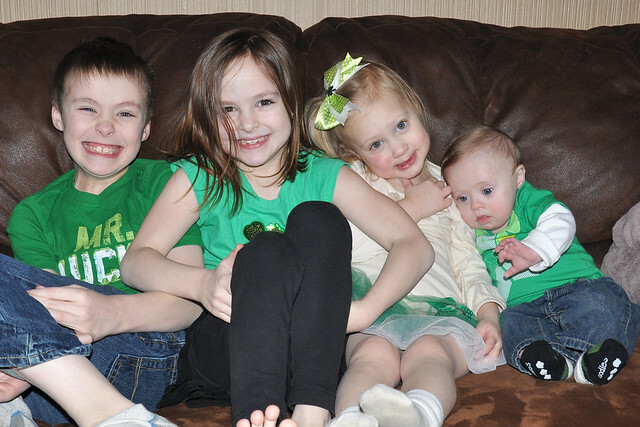 We had a great St. Patrick's Day! All of those little touches, which didn't take up much of my time at all, made the day so special! 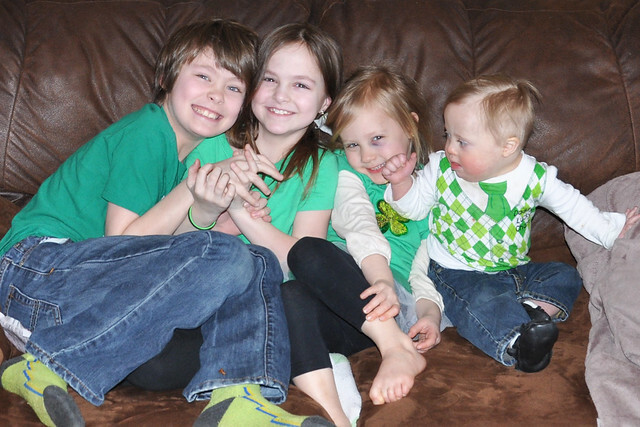 It's hard to believe, but another St. Patrick's Day already came and went! 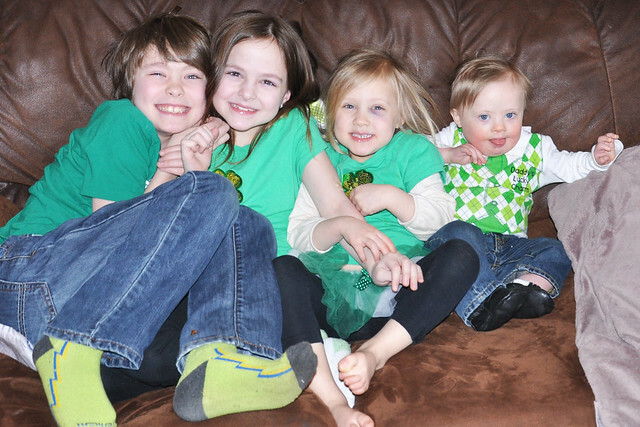 My little leprechauns are growing much too quickly! WOW! You're so on top of things, Mama! 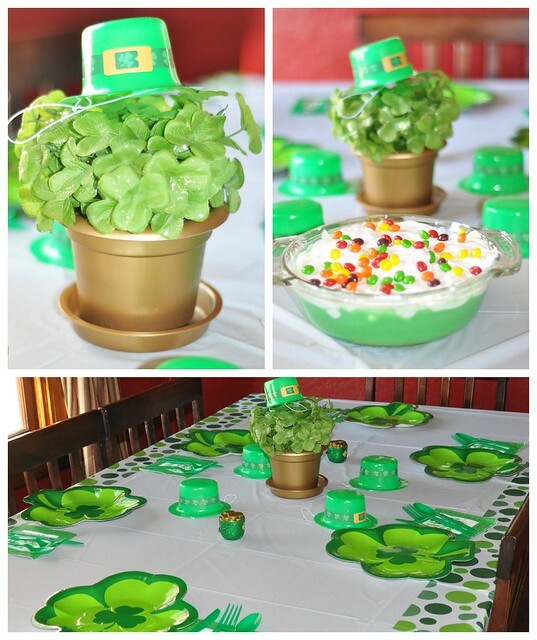 The green decor, the yummy dinner, picture taking, crafts and yummy desserts! Where do I nominate you for an "amazing mom" award?! You rock! Awww, thank you! I just try to make the day special for my kids! The Taste the Rainbow idea is darling!!! Fun treats! That one picture of Liam is adorable! Thank you! 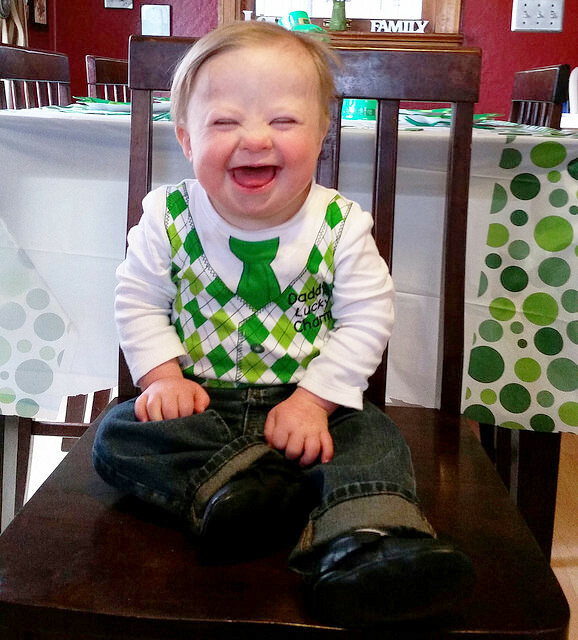 He is such a smiley little guy! I love what you did for your little family. I think I'm going to borrow some of these ideas for next year. Thank you! I don't go completely overboard. I just like to add little touches! A Day In The Life? HA!